Katherine & William’s wedding was gorgeous! For starters, it was at the Grand Del Mar. Beautiful location, check. Add gorgeous couple with fabulous taste, check. Add fun family, great food, and an incredible band, check. Perfection. And to make it fabulous, Katie and I worked with Alex of Blush Botanicals on all elements of the decor. Check out the bridal bouquet created by Blush Botanicals! It is made entirely of white peonies! And I adore these gold sequin bridesmaids’ dresses that Katie picked! And also look at these handsome men below! Breaking from tradition, they decided against boutonnieres. But they still look fabulous! For the ceremony, we decided to be penny-wise and actually used centerpieces from the ballroom to highlight the front of the ceremony and to flank the aisle. The only décor cost for the ceremony was the stands and a nominal labor charge to move the pieces. And it was also a great environmentally conscious decision since we were able to use all these flowers twice! Especially since each centerpiece contained over 200 roses! For the ballroom, we chose a palette of gold, ivory, and soft pink. We used a number of mirrored tables throughout the room (including the head table above)and tons of candles so that he room truly glowed! Everything seemed to reflect! And notice the head table centerpieces above, that were transferred from the ceremony! Katie’s family is good friends with Susan Foster, the owner of Encore Entertainment, so of course, there would be dancing! Encore has incredible musicians and singers but what always impresses me about them is their sound quality-it’s always perfect! And when you want everyone to both hear the speeches but also not be overwhelmed during the performance time, that’ truly a hard feat to master. And to capture all of these amazing details and this gorgeous couple, True Photography was up to the task! These photos, like every event of mine they shoot, were perfect! There is nothing wrong with being penny wise and environmentally conscious so use your ceremony florals in your dinner when you can. As long as the cocktail hour is in a separate location from the dinner, this works flawlessly. After the ceremony, we invited guests onto a beautiful patio in a different location for appetizers and beverages. During that hour, the floral team is able to move pieces from the ceremony to the ballroom. Then when guests come in for dinner, everything is set perfectly! I personally don’t like it when guests can see this kind of movement and resetting…but if they can’t see it, then go for it! This month, I thought it would be fun to feature my most recent tabletop I put together for San Diego Style Weddings Magazine! For this photo shoot, I wanted to re-create the feeling of one of my favorite summer activities to do with my family — go on picnics! I thought it would be fun to mix bright colored flowers in pinks and yellows, blue checkered linen, floral china, wood lanterns, and sweet touches of blue mercury glass votives. To create this design, I teamed up again with one of my favorite florists, Chris & Kim from Indulge Weddings & Special Events. Envisioning then orchestrating the concept for an elegant styled “picnic” was so much fun! Selecting the eclectic pieces of glassware, flatware, and adding the mason jars as drinking glasses not only created a whimsical look, but definitely felt like summer! Traditionally, banquet tables are round with chivari chairs…however, I thought it would be more picnic-like to bring in a rectangular table and pare it with the Tuscan Café chairs. I think it gives it more of that summer luncheon feel! From a designer’s stand point, adding in even the simplest details makes a huge difference when creating your concept. From the wooden accents, to the glass water bottles as the table numbers, to the bright colored striped paper straws, all give a picnic feel. Adding in the beautiful floral designs, just makes it that much more special. The always incredible True Photography did an amazing job in capturing all the detailed shots of my tabletop décor! Another one of my favorite and #trending wedding details is the “naked” wedding cake; otherwise known as an unfrosted cake. The contrasting cake layers and filling create a more casual yet elegant feel. Adding florals and greenery make it stunning! Steal this idea: This style is perfect for that couple who wants to have an intimate backyard styled wedding, but wants to add a little more oomph! of elegance and still have their theme be bold and fun. 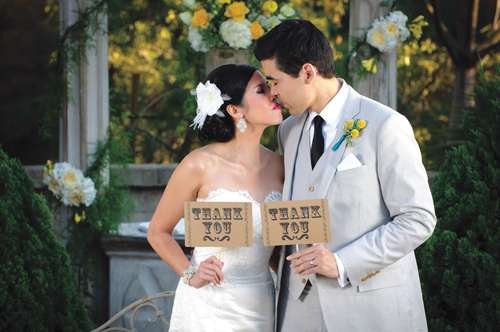 If you’re a DIY bride or even an eco-friendly bride this concept may also be perfect for you! Grab your childhood picnic blanket, a couple of mason jars, some of your grandmothers fine china, bright beautiful flowers, some pillar candles and call it a day! Sometimes the best creations are the ones that didn’t have so much thought put into them. Just love. After I had designed this tabletop, a client of mine actually decided to replicate the look for their outdoor rehearsal dinner at the La Jolla Country Club. We strung lights over head and it was perfect and gorgeous!